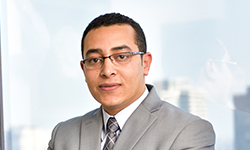 Marwan obtained his LLB from the Faculty of Law at Alexandria University in 2009, and later received his LLM in International Legal Commercial Transactions and Logistics from Arab Academy of Science and Technology in 2011. He joined the firm in 2009 and became a Senior Associate in 2014. He specialises in the field of Intellectual Property where he has extensive experience handling high profile multinationals. In the field of IP law, he is able to provide legal support, conduct clearance trademarks’ searches and investigations, register national and international trademarks, deal with refusals and oppositions of registrations, and file appeals/oppositions and counter-statements. He acts as an advocate and trademark attorney for major clients, small businesses, corporations, and multinationals. Marwan is a member of the Egyptian Bar Association, Egyptian Patent and Trademark Associations, International Trademark Association (INTA), and the Egyptian Association for Protection of Industrial Property (AEPPI).